Although Newberg's participation in the America's Best Cities contest is in the rearview mirror, an idea hatched during that period has come to life over the past year. Establishing a technology incubator was a plausible measure the community considered taking in order to attract more high-paying jobs to the area, but even after Newberg was eliminated from the contest the concept was identified as a high priority by the city of Newberg in its Economic Development Strategy. So when the Chehalem Park and Recreation District offered to provide free office space for the endeavor, the effort began in earnest and the Chehalem Valley Innovation Accelerator (CVIA) opened in the summer of 2016. Operating under the umbrella of the Chehalem Valley Chamber of Commerce, at least until it becomes stable enough to become independent, the accelerator is now hosting three tech-based business start-ups in Newberg and supporting broader high-tech economic development efforts in the greater North Willamette Valley region. "The quid pro quo is we provide facilities, coaching and mentoring, help find the right industry partners and customers, help you find funding, if you will commit to having your business stay out here in the Chehalem Valley region for a period of two to three years," project director Carr Biggerstaff said. One of the project's chief tasks was to transform the CPRD offices offered up for its use into a more functional and inviting "maker space" for clients. To do that, Biggerstaff reached out to partner with Newberg High School, which recruited approximately 80 graphic design students to participate in a challenge to decorate the walls, windows and even the floors of the accelarator's largest room, known as the "fermentation tank." The winning student, then-senior Geoffrey Carstensen, created six tech-inspired logos for the windows and incorporated them into a bright green electrical circuit-themed design for the walls of the room. Installation, however, wasn't completed until July. "The sad part was that by the time we got the graphics implemented on the walls he was long gone," Biggerstaff said. "But his work is there and it's good looking work." Biggerstaff said one of the lessons already learned is that concentrating operations for the start-ups within the physical space of the accelerator has not been as important as first believed. 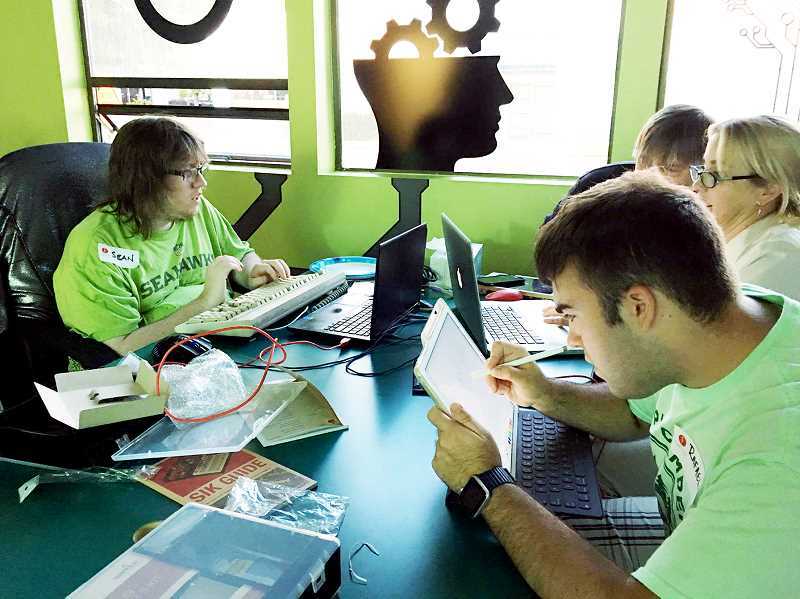 Although the Fermentation Tank is being used to host a weekly innovation camp by Fidgetech, a start-up that focuses on providing high-tech training to young adults on the Autism spectrum, the project has been operating more as a "distributed" accelerator by supporting its clients' work in other locations. For example, the local innovation camp could develop into a second iteration of Fidgetech's Explorer Program, which provides an introduction to a wide variety of technologies, but operates out of Lake Oswego because there was already demand and space available there. The accelerator also helps its start-ups by connecting them with resources and potential partners, like the George Fox University engineering program, as dean Bob Harder serves on the CVIA board of directors. Biggerstaff has also reached out to a variety of experts in various business and technology fields, from marketing and legal services to manufacturing and human resources, so that he can quickly direct start-ups to them when needed. The accelerator has also supported broader regional efforts like Innovate Yamhill County's initiative around agile learning in the classroom and helped organize the Willamette Valley Drone Challenge so that students at 10 different high schools could provide mutual sport for their drone projects. "We're kind of like a start-up for start-ups, so we're figuring this out as we go, too," Biggerstaff said. For more information, visit www.chehalemvia.com.